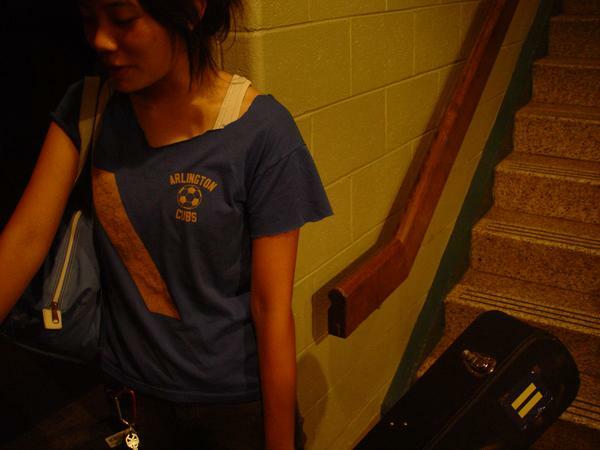 A couple of nights before flying from Fort Riley, Kansas, to Afghanistan in August 2008, I saw the folk-rock artist Thao Nguyen and her band The Get Down Stay Down in a bar on Massachusetts Avenue in Lawrence, Kansas. I already knew Nguyen’s music a little, and a little about her biography, which interested me as much as her music. Raised in the Vietnamese immigrant neighborhoods that surrounded my parents’ house in northern Virginia, Nguyen in an early publicity shot appears wearing a jersey adorned with the logo of the “Arlington Cubs,” a sports club for whom my brothers and I played on countless baseball, basketball, and football teams in our youth. Later, Nguyen attended William and Mary college, which is a very good school but not one known for producing rock stars. By 2008, though, she had a couple of albums out and a hit—a girl-power anthem titled “Swimming Pools”—playing frequently on my local indie-alt station. The pre-flight concert in Lawrence was just what the doctor ordered in terms of a night out before heading into the unknown. The Get Down Stay Down were tight-and-rocking, and all the songs, even the ones I didn’t know, were accessible and engaging. While singing, Nguyen appears possessed to the point of being spastic, and her voice sometimes hits atonal notes as if her Vietnamese were in contest with her English. It’s all good, though, and in-between songs, she charmed with funny anecdotes and quips delivered in the mid-Atlantic-coast tones and cadences I knew growing up. Before she went on, Nguyen ordered whiskey at the bar and watched the warm-up band play a couple of songs, and then wandered out to the sidewalk to hang with the smokers for a while. After the show, at the merch table, I don’t think I said anything to Nguyen about Afghanistan—I mean, I hope I didn’t, it would have been too obvious—but I do remember asking her where she went to high school. She told me she had attended Thomas Jefferson High School for Science and Technology—a northern Virginia magnet-school for super-smarties. I thought about asking her if she had known the baseball coach, who was one of my best friends growing up, but that seemed kind of insipid. This inconsequential exchange brought our interaction to a close, save for my purchase of her second album, Like the Linen, which I listened to often on the long flight to Afghanistan and in the year that followed. Like the Linen is good, but it was the album that Thao & The Get Down Stay Down released next that spoke to me personally. Called Know Better, Learn Faster, it’s the post-deployment record I’ve probably listened to more than any other, and certainly more often start-to-finish than any other. For me, it’s a unique swirl of appealing sound, beat, voice, and words, never more so than in the title song, whose chorus beguiles like a mantra reflecting something of my own sense of self-reproach, felt sharply in the two-to-three years just after deployment and only somewhat diminished now. That first flight to Afghanistan was part of an Army-thing called a “Pre-Deployment Site Survey,” or, in words barely more comprehensible, a brief leaders’ reconnaissance of the area to which we would later bring our troops. In November 2008 I began the first leg of the journey that would take my advisor team and me to Afghanistan for a year. Catching a plane at LaGuardia in NYC back to Kansas I stood in the early-morning TSA line next to a scruffy dude whose mussed hair and road-worn attire proclaimed a rock-and-roll lifer. I don’t remember who started the conversation, but the guy was a gabby type who told me that he was the sound tech for a group called The Walkmen and he had come straight to the airport from a gig. I gulped, because The Walkmen, a band I already knew, play the kind of literate rock music that’s catnip to me—something like a combination of two other bands I like a lot, The Strokes and Interpol. Thanks to the slow-moving long line, we had plenty of time to talk and our conversation ranged wide-and-far. After I told him I was in the Army, he told me that he had grown up in Arlington, where his father had been a two-star Special Forces general at the Pentagon. Well damn, I thought then and now, and I suppose, since we exchanged emails and he still appears in my Facebook and LinkedIn feeds as a suggested contact, I could find out if he was pulling my leg or not. The Walkmen, I’ve since learned, are from DC, so maybe it checks out. Whatever, I like the story as is, especially since I enjoy The Walkmen’s music so much, and, like Thao Ngueyn and her band, they are bound to my memories of going to war. Below’s a good one by them. It’s my favorite kind of song, a fast-sad one, about friends, remembering, and fighting for things that are worth fighting for. This entry was posted on October 6, 2018 at 6:36 am and is filed under Art and War. You can subscribe via RSS 2.0 feed to this post's comments. Hey it’s all free now, thanks to the glory that is the internet–enjoy! Thanks, Jeff! I tried to include a reference to time in as many sentences as possible and not make it seem too heavy-handed. Re Kansas, I spent two months as a captain and year as a major at Leavenworth and ten or so weeks at Riley training for Afghanistan and have some wonderful memories of the state. I could read posts like this all day. I really like the sound of both of these bands, especially the first song – Thao’s voice sounds a tiny bit like Leslie Feist’s to me. And that is a great story about the Walkmen sound guy. Thanks, Andria–if you like this post, be sure to check out my old blog 15-Month Adventure. It’s way more “personal” than Time Now (it was also a lot more popular).